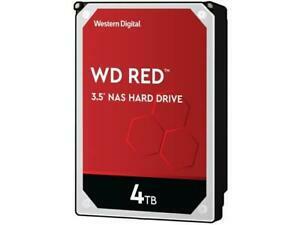 Increase your storage capacity with the WD Red from Western Digital! The SATA III interface transfers data at speeds up to 600 MB/sec, while IntelliPower on the WD Red manages energy consumption for boosted performance. I've implemented these in a few different use scenarios (Synology / Drobo / Dell NAS, server raids, desktop raids) and the price / performance ratio on these is great. Since 6/8 TB drives are available, these have come down in price where an 8-15 bay NAS or 2-8 bay desktop / server storage setup gives you reliability, performance and capacity for ~$130-150 per drive. Have read reviews of others who have had DOA issues with WD Reds, but I've bought and installed about 3 dozen of these over the last 2 years (from Newegg, eBay, Amazon, etc) and have had precisely 0 issues. For file / backup storage, Plex Media server (or other DLNA setup), or surveillance data storage, these have worked in everything I've tried, and comparatively to WD drives of the 2000's has really renewed my faith in WD products. I look forward to eventually replacing these with 8TB+ drives in the coming years! 5400 rpm... Does it had intellipower? I don't think it does... look up the model numbers description on wd site... It says it's a5400 rpm and nothing about intellipower... If you can prove its intellipower, I'll give 5 stars. Big (4TB) SATA drives for your NAS appliance. If you want bigger, you can get these drives in 6, 8 and 10TB sizes. 4TB was big enough for me. Not super fast, they spin at 5,400rpm but when you organize them into a RAID array and use them for non-performance critical workloads they work great. Would buy these again because, according to BackBlaze Hard Drive reliability report, the failure rate on these drives is very low (less than 2% per year) They also come with a 3 year manufacturer's warranty. Wonderful performance and no noise. I took-out my old hard disc from my NAS(Synology 212J) and install two of purchased Western Digital Red 4TB for RAID 1. It took almost one and half day to complete 'repair' for 1 TB datas The speed was not so fast because of my NAS but the speed was about 5.0 mb/sec ave. I really appreciated the low noise level!!! I could not listen any operating sound of hard disc at less than 1 ft away from NAS Power-on time was checked by almost 9400 hr. but I am satisfied with their (I baught 2) performance and reasonable price. Packing was 100% safe and secure. Thank to Seller ! I have been running these drives for the past few days. I love them because they are quiet. The price i paid was reasonable for the size I have (4TB). I plan to get more of these drives in the future as my proffered storage. If you have a NAS system you (NEED) these NAS drives. Desktop drives will not hold up for the daily use of any NAS (Network Attached Storage). Tip: shop around before you buy any NAS hard drive to get the best possible price for your needs.